Avnish Bhatt graduated in Law and went on to do Masters in Law from Hidayatullah National Law University. He has worked as a Lawyer in High Court and Supreme Court. He is a Judo Player and also teaches Judo. He was also the youngest international referee in India in Judo. 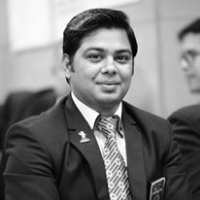 He is a Member of Amity University Sports Selection Board. He has worked as an Advocate at District Bar Association, Dehradun. He is Assistant Professor at ICFAI University. General law means territorial law of a country. It consists of all persons, things, acts and events within the territory of a country which are governed by it. "After graduating in Law, I went on to do Masters in Law from Hidayatullah National Law University. I am a Judo Player and also teach Judo. I am a Member of Amity University Sports Selection Board. I have worked as an Advocate at District Bar Association, Dehradun. I am Assistant Professor at ICFAI University."